In yesterday’s Daily Telegraph the Secretary of State for Education, Damien Hinds, outlined his 5-point vision for technology in schools and not long after education twitter exploded with a host of responses both challenging and supporting what he had said. To many people the ‘debate’ around technology in schools appears neither important nor controversial, but after yesterday’s conversation, I think that EdTech has proven itself to be both of those things. According to Hinds, the decision by the Labour government to roll out interactive whiteboards to all schools over a decade ago, with no support from teachers, has led to no real subsequent rise in pupil’s attainment. Even now schools apparently remain baffled by the thousands of possibilities tech companies appear to offer, and need help sorting the useful from the gimmicky. Responses in the twitterverse ranged from outright support of his new vision of a digital revolution, to deep cynicism from heads and teachers about the ‘magic beans’ required to afford such technology. Technology isn’t a distraction from the 3 r’s, it’s a way of improving innovation, independence and inspiration in student’s learning. Writing and publishing your own blog helps you to engage with the audience and context of your writing; learning computer code helps students to apply mathematical and logical thinking to real-world problems. It also helps with giving a quantative and visual representation of meaningful data, in a way not possible before. Accelerated reader, for example, uses old fashioned comprehension questions to track children’s reading progress by months and years, whilst SISRA analytics has changed the way secondary schools think about expected GCSE and A level results. I would argue that by putting interactive whiteboards in all schools the previous government ensured that all children had access to more engaging ways of presenting learning (especially important for those with additional needs). Over the last 10 years’ teachers have had an opportunity to challenge and change the way that they think about their lesson plans and delivery, and most of the teachers I’ve ever met are enthusiastic and interested to find more ways that technology can help them to make their job easier and paperwork quicker. There’s no doubt now that the EdTech market has changed significantly since this point, and that the range of products and possibilities on the market is now massive. From robots to virtual reality to online assessment, this is where educators, tech companies and politicians can all agree that a revolution in education is really possible. With the right buying advice for heads, with helpful teacher feedback to the tech companies and with full support and CPD for staff, Hinds’s 5-point plan for technology in schools certainly has the potential to change the skills and outlook for the next generation of inventors and innovators. 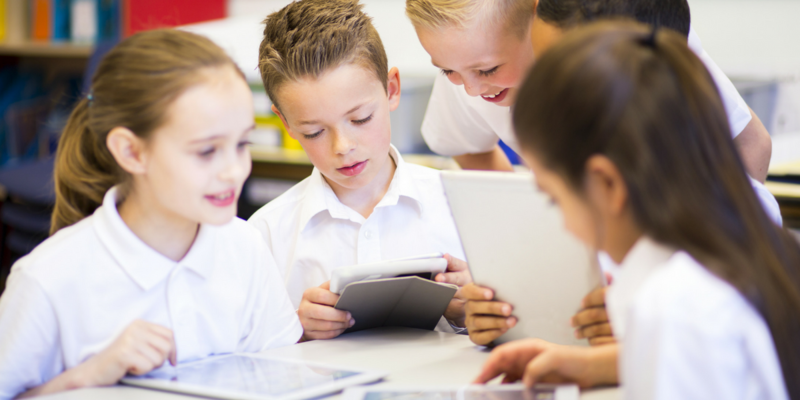 Interested in finding out how technology can revolutionise learning in your school? Talk to your turn IT on consultant now to find the best products for your students and staff, and get support and training so that they can maximize their potential. #WomenInTech are a thing, and they’re visiting some of our schools in East London.